Directed by Don Siegel and written by Richard Collins, Riot in Cell Block 11 is the story of a riot among prisoners toward the corrupt guards and people at the prison. The film is a look into the world of prison as it feature a mixture of real actors and real-life prisoners in a chaotic setting that is shot in an actual prison to blur the lines between reality and fiction. Starring Neville Brand, Emile Meyer, Frank Faylen, Leo Gordon, and Robert Osterloh. Riot in Cell Block 11 is a gripping and evocative film from Don Siegel. Set in a prison during a tumultuous time where prisoners and the authority become more unease with each other. The film revolves a group of prisoners in a prison cell block who stage a riot against the guards and keep them hostage forcing the warden to be the negotiator amidst pressures from the government. 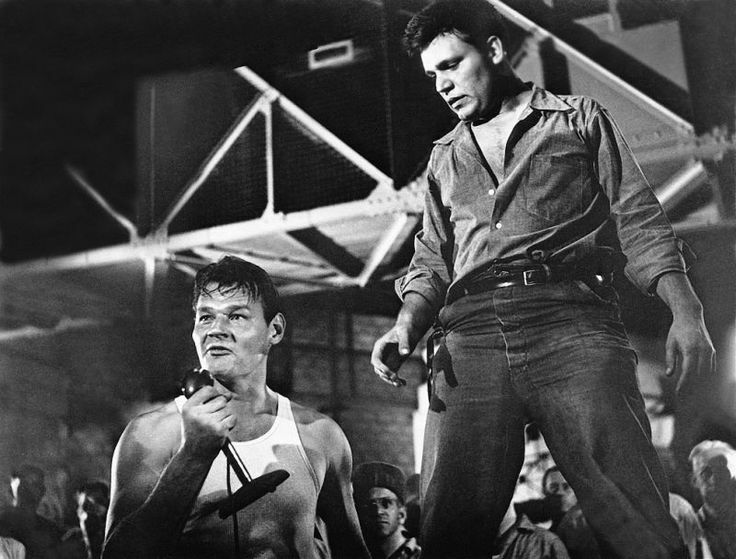 It’s a film with a simple premise yet it is about a test of will and wits between the warden Reynolds (Emile Meyer) and the lead prisoner James V. Dunn (Neville Brand) as the latter is standing up for his fellow prisoners due to the horrible living conditions, terrible food, brutal guards, and overcrowding. Richard Collins’ screenplay show what these prisoners are dealing with as it would be a moment in fooling a guard where everything come into play. While Reynolds is aware that everything isn’t perfect, he is willing to listen to the prisoners with Dunn getting advice from a reasonable inmate known as the Colonel (Robert Osterloh) and a more crazed inmate in Mike Carnie (Leo Gordon). Yet, Reynolds is dealing with the police commissioner Haskell (Frank Faylen) who refuses to listen to the prisoners. It would eventually lead to some showdown where Haskell’s approach would prove to be troubling forcing Reynolds to take matters for a non-violent resolution where he knew that if an inmate is killed that the inmates would kill a guard. Don Siegel’s direction is definitely intense in terms of the atmosphere that looms throughout the film as it is shot on location in the actual Folsom State Prison that was provided by the connections of Siegel’s assistant/dialogue coach in Sam Peckinpah. The scenes inside the prisons show Siegel using a lot of wide and medium shots to get into the scope of how big the halls are but also playing into the claustrophobia into the lack of space for the cells the prisoners have to live in. While there are some exterior shots at the prison, Siegel does maintain an air of suspense for a sequence in which state police officers try to deal with other prisoners rioting from other cell blocks where it’s Siegel’s attention-to-detail that is key into the moment where something is going to happen. The scenes where Reynolds and Dunn would meet where they’re separated by a door with the press watching just add to the dramatic stakes as Siegel knows where to frame everything and see what would happen. Overall, Siegel creates a chilling yet engrossing film about a prison riot. Cinematographer Russell Harlan does brilliant work with the film’s black-and-white photography from the low-key yet mesmerizing lighting in the interior of the halls and for some of the exteriors at night to the usage of natural lights for the daytime exterior scenes. Editor Bruce B. Pierce does excellent work with the editing as it is very straightforward to play into the dramatic suspense and tension that looms throughout the film. Art director David Milton and set decorator Robert Priestley do terrific work with the look of the warden’s office as well as what the cells look like from inside. Sound recordist Paul Schmutz Sr. does fantastic work with the sound in capturing the sense of chaos in the cell blocks during the riots. The film’s music by Herschel Burke Gilbert is superb for its usage of low-key orchestral music to play into the drama and suspense. The film’s wonderful cast include some notable small roles from Don Keefer as a reporter, Paul Frees as a guard named Monroe, Whit Bissell and Dabbs Greer as a couple of guards taken hostage, and Robert Patten as a convict named Frank. Robert Osterloh is superb as a convict known as the Colonel as a former military officer who is in prison for a manslaughter charge as he tries to be the reasonable person that doesn’t want violence to lose sight of the bigger picture. Frank Faylen is terrific as Commissioner Haskell as an official that wants to punish the prisoners severely as he doesn’t care about their demands. Leo Gordon is fantastic as Mike Carnie as a crazed sadist that is willing to beat up the guards as he is more concerned with creating chaos and beat people up. Emile Meyer is excellent as Warden Reynolds as a man trying to maintain some control and listen to the prisoners but also know that whatever he gives them wouldn’t be enough. Finally, there’s Neville Brand in an amazing performance as James V. Dunn as a prisoner who takes charge of the riot and tries to make sure things go well while also willing to take steps into the negotiation knowing what he and some of the inmates are willing to do. Riot in Cell Bock 11 is an incredible film from Don Siegel. Featuring a great cast, a riveting story, and eerie visuals that help play into the dramatic suspense. It’s a film that explores the world of prison as well as create a sense of realism and grit that was lacking in most Hollywood films about prisons. In the end, Riot in Cell Block 11 is a sensational film from Don Siegel.